Rot in thy grave, thou dotard, I defie thee. And play the mother to anothers brat? 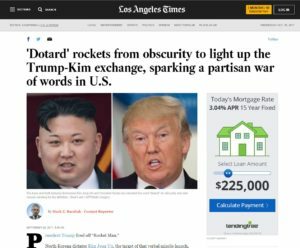 Last month, when North Korean strongman Kim Jong-un called Donald Trump a “mentally deranged U.S. dotard,” he helped to revive an ancient term used by none other than Chaucer and Shakespeare that had fallen into disuse. The most innocent explanation for the president*’s actions is that he’s a blundering dotard who can’t stop himself from destroying democratic institutions and from tripping over federal statutes. High on a hill is a blundering dotard. Hmm, on second thought, we’d better not go there, lest the ghost of Oscar Hammerstein punish me this Halloween. To his credit, Pierce, certainly a champion of Chaucer and Shakespeare, offered Kim some credit for helping to keep Elizabethan language in our discourse. 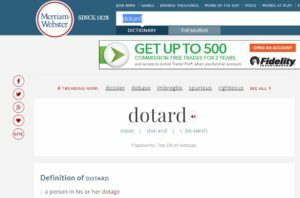 “I would like to thank Kim for bringing ‘dotard’ back,” Pierce offered. There was no comment from the other lexicographer, Donald Trump, on Kim’s contribution to the English tongue. 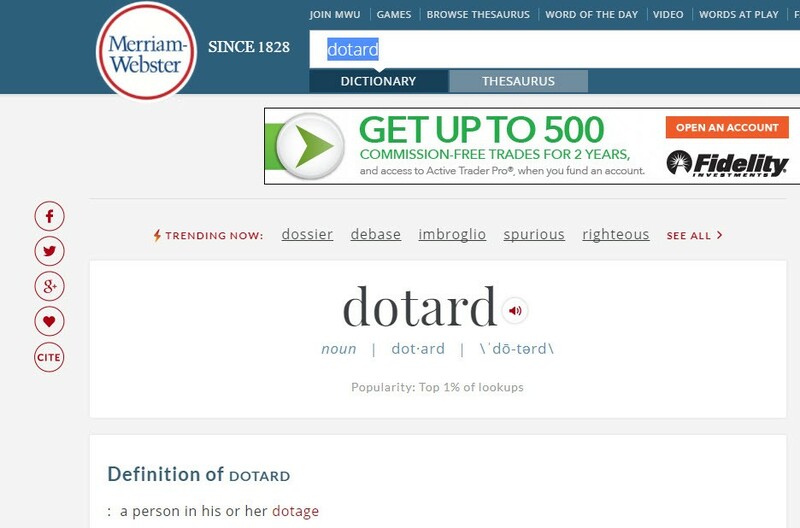 By great coincidence, our good friend, teacher and poet, Ann Morahan, inspired by so many people intent on accessing Merriam-Webster and other websites, sent a poem, Ode To A Dotard, for Plunderbund readers to enjoy. 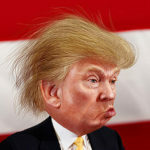 Since we are now celebrating the centenary of World War I, Ann is reminding us that the behavior of Donald Trump and Kim Jong-un, particularly with the use of the word dotard, might mark this feud between the two beefy bloviating bullies with bad haircuts as the beginning of, yes, Word War I. Some more about Ann Morahan: A retired teacher who spent 37 years in the classroom, Ann taught English as a second language as well as Spanish during her professional career in K-12 settings. Due to the present national political situation, she determined to study as well as write poetry to assist in maintaining some semblance of sanity and also devote time to be a first-grade classroom volunteer and tutor for immigrant families. Indeed, like Maria von Trapp before her, she has a way with words and also plays the guitar to express her interests in lonely goatherds, er lonely dotards, in the White House. To you he’s Rocket Man. You are trying to ban. His mop black as coal.